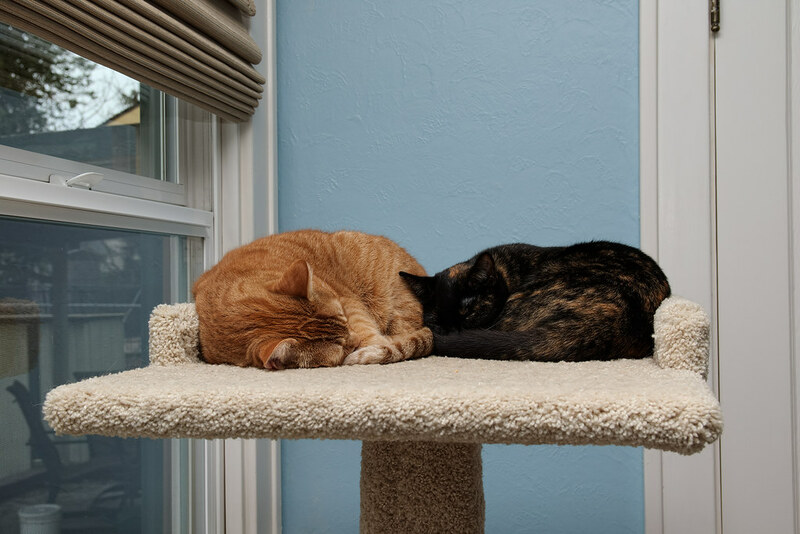 At the end of 2015, Sam and Trixie snuggling and sleeping on the top shelf of the cat tree in my office. Sam looks large next to Trixie but he’s a small cat, it’s just that Trixie is tiny. 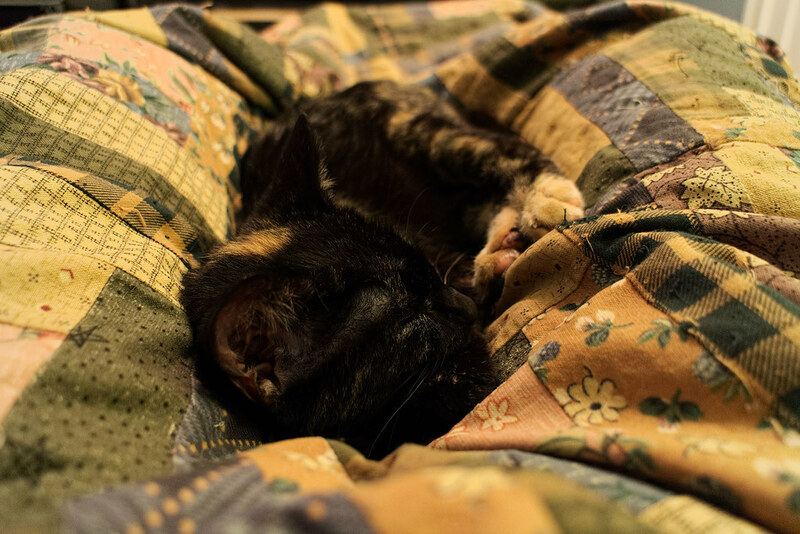 After adopting Trixie I was curious to see if we would see any signs of tortitude – the supposed tortoiseshell attitude – in our tiny little cat but none has manifested itself. I call her Little Lover as she is very affectionate and loves to snuggle, both with us and with the other cats. She had been with us less than a month when I took this picture of her in my lap last winter. For my trip to the Olympic peninsula this spring, more than anything I wanted to visit the Hoh Rain Forest when it was raining, which you wouldn’t think would be too hard given that it is an actual rain forest. But for me the Hoh has always been the Hoh Rain Adjacent Forest, as I’ve gotten drenched in many parts of the park but the rain always stopped before I reached the Hoh. This time I waited until rain was predicted for the weekend, made my reservations, loaded up the Subaru and set off. There was no rain as I drove into Washington but not long after I pointed the car towards the peninsula the heavens opened and it poured. By the time I reached the Quinault Rain Forest the rain had lessened but I was pleased to see I would get rain in this rain forest at the very least. As I put on my rain pants and walked to the trailhead, the rain stopped literally as I stepped onto the trail. Did Mother Nature think I was amused? In truth I was, wondering if I’d get rain the next day or if the Hoh was to be my Wet Whale. 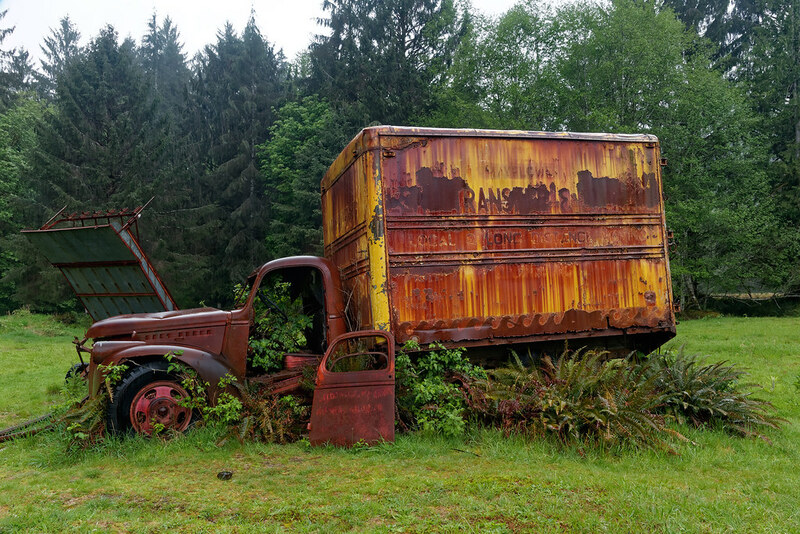 I had been drenched in the Quinault before so the suddenly dry skies weren’t too much of a disappointment and I started up the Maple Glade Loop Trail and the Kestner Homestead Trail, stopping at the homestead to photograph this dilapidated old moving van with trees growing inside, an old favorite from a previous visit. They keep the area around the truck mowed but are letting nature reclaim the truck. Ashes to ashes, dust to rust. As I photographed the truck I was caught off guard when the rain began pounding down once more. I took a few more pictures before retreating to a covered picnic area. The large drops made a racket as they pelted the corrugated metal roof and then somehow it rained even harder. As I admired the rain I realized I was laughing out loud, not with a chuckle, but a good loud belly laugh. I immediately stopped and looked self-consciously around but there was no one else around, apparently not everyone loves the rain. 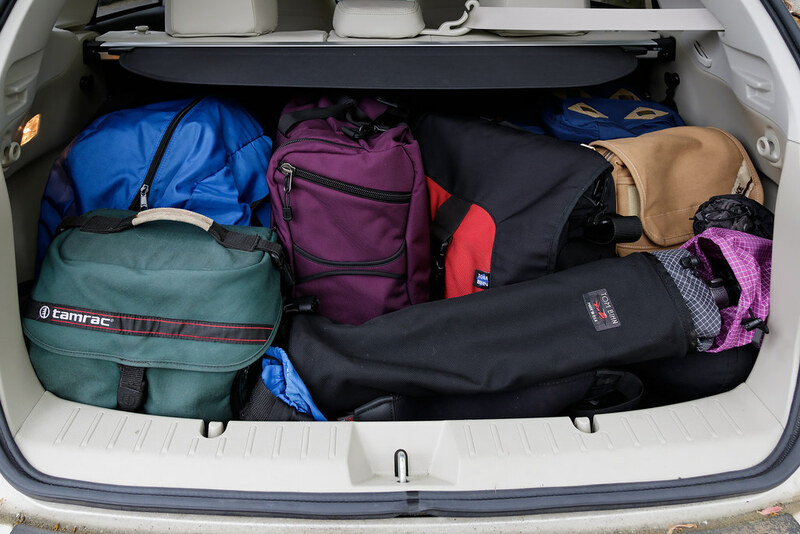 I ventured out for a few more pictures but suddenly realized my biggest mistake in my desire to pack lightly, as I hadn’t brought a backup camera or lens. The camera is weather sealed but the lens isn’t and makes them both vulnerable where they connect. So mostly I just stood there and reveled in the rain, soaking it in in case tomorrow dawned dry. The next morning I drove to the Hoh, knowing the weather was going to improve throughout the weekend, if improve means more and more sun, so I wasn’t sure if I’d finally get my rain. As I drove towards the park in a heavy overcast, the sun suddenly appeared and I said out loud, “You are not welcome here!” It quickly disappeared behind the clouds and, a bit surprised and a little terrified at my sudden powers, I continued on to the trailhead as a gentle rain began to fall. At long last, rain in the Hoh. 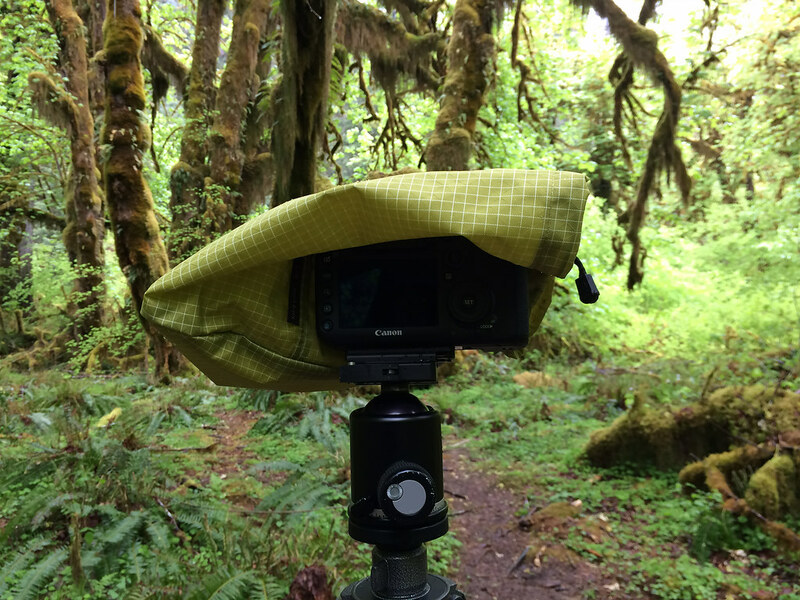 I used one of my Tom Bihn Stuff Sacks to cover the camera and lens while hiking, and when taking pictures the material is pliant enough that I could lay the bag over the top of the camera and keep rain from hitting the lens. The outside of the bag was damp from the rain, but it was drops of rain I was worried about. That worked fine and kept the gear dry both days it rained. One of the Hoh trails was closed, a bit of a shame as it was one where I wanted to photograph moss, so instead I spent the afternoon hiking to Sol Duc Falls in the rain. The next morning the sun rose and never yielded, but I had fun visiting a few beaches, two of which I had never been to before, and headed back to Portland. I got home in time to take Ellie for her walk, always one of my favorite parts of the day. As I walked to the train station the next morning to go back to work, still reveling in three days of hiking in such a beautiful place, I couldn’t help but reflect on the many blessings in my life. I ordered my Tom Bihn Aeronaut 45 in December 2014 to use as my main travel bag but it had been sitting idle for a year and a half. Not because I didn’t like the bag, but because I wasn’t taking trips. Understandable at first, as Emma died soon after and left me broken-hearted, then we adopted Trixie and there was much work to be done getting her introduced and accepted by the others. And late in 2015 and early in 2016 my project at work left me too tired to want to drive anywhere. But mostly I was just not dealing with the daily stresses of life as well as I should have. So after my project finished up I decided it was time to put things to right. Since the commute to work had gotten more and more stressful the past few years, the last thing I wanted to do on weekends was get back in the car, so I quit driving to work and went back to taking the light rail. It takes longer but (most days) is less stressful and I added a few things that make the train time more enjoyable than it used to be. My goal was not just to reduce the daily stress but also to make me more willing to get in the car to go hiking. I’ve long wanted is to have a handful of places within a day’s drive that I visit frequently enough that I can schedule a trip without much planning at any time of the year, so the next step was to start taking some short trips. In April I chose the easiest such place, the lower elevations of Olympic National Park, a place I had been to a handful of times. 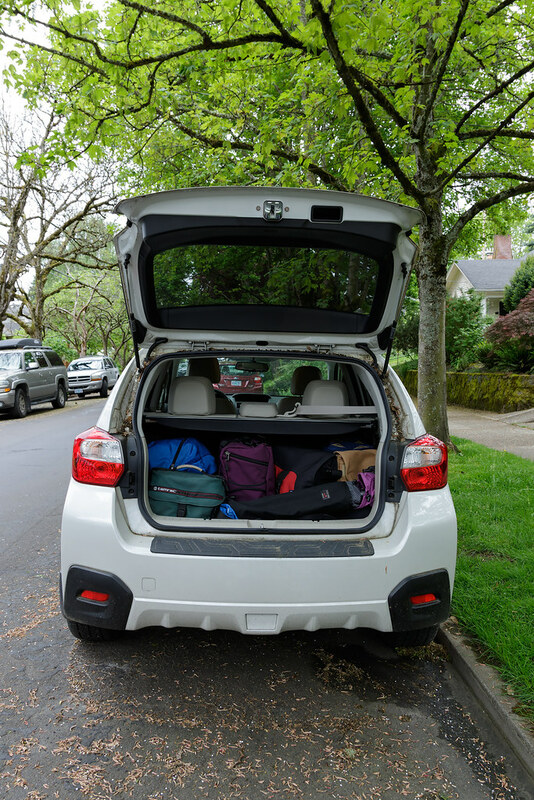 I deliberately chose a weekend where rain was expected as I wanted it to rain while I was in the rain forests, so I made my plans on a promising weekend, loaded up the Subaru, and I was off to the Olympics. The Aeronaut (the Aubergine bag in the middle) was joined on its inaugural trip by my beloved Tom Bihn ID carrying my computer, as it has every day for 13 years. Joining them were my Tom Bihn Guide’s Pack as my backpack (I’ve had the bag for a while but this was my first chance to test its new padded hip belts), the Tom Bihn Tripod Quiver carrying my tripod, plus a variety of smaller Tom Bihn bags like organizers and stuff sacks. And even a few non-Bihn bags, a couple of which I’ve had for decades. Most notably my Tamrac camera bag holding my camera gear as it has for every hike for the past couple of decades, but which may finally be approaching the end of its active use. Also a Nike duffel that carried extra clothes since it was hard to tell how warm or cold or wet or dry the weekend was going to be. 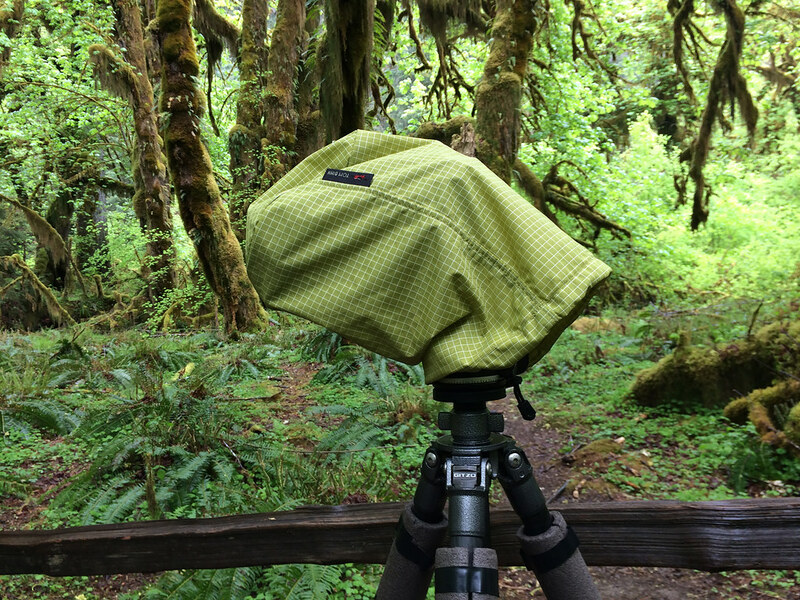 This one is also decades old but it’s led an easy life, mostly either storing extra gear on trips like this from spring to fall, and during the winter storing a small army of old towels that I use when photographing at Ridgefield on rainy days. Rounding out the crew of bags was my Domke F-5XB camera bag, a small bag that normally I use for short little trips like when walking our dog Ellie, and while I don’t take it hiking it is handy for storing overflow camera gear on trips like this. The bags worked well and took some of the friction out of packing and traveling and a couple of months later I packed them up again for my second hiking trip, with more to come soon. The Aeronaut got its first real test when it joined the ID and Domke bags on a trip to visit family, my first flight in years and my first time with all carry-on, the backpack straps and grab handles on the Aeronaut really showed their worth on that trip. I fell in love with it on the first trip, it’s not an inexpensive bag but like all my Tom Bihn bags it’s thoughtfully designed and manufactured and I expect it will join the ranks of bags I use happily for many years. 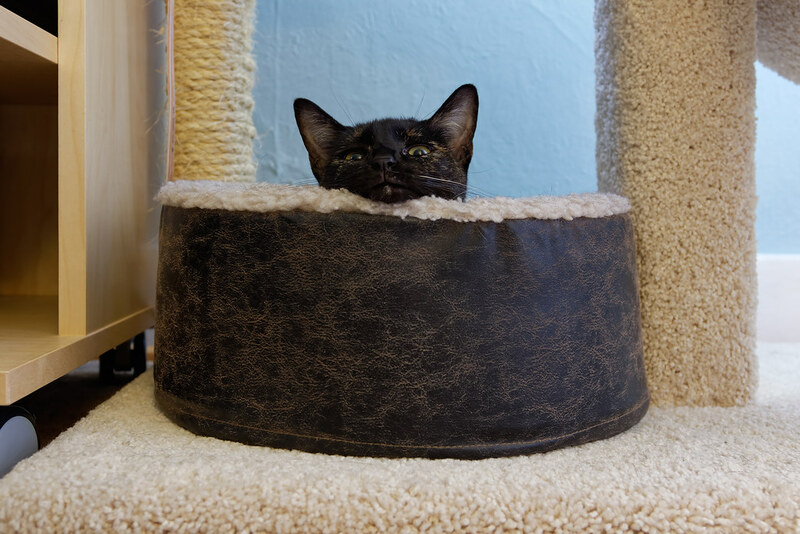 I had to laugh when I saw a young Trixie watching me with her head sticking up out of the cat bed. Scout at times would watch me like this, all the more amusing since she insisted on having her bed right beside me, her face inches away. It’s been a lovely 4th of July weekend. The weather has been perfect, warming to the 70’s during the day and cooling off into the 50’s at night. There haven’t been many neighborhood fireworks so far so we’ve been able to keep the windows open except during the hottest part of the day. To minimize the stress on the pets we’ll keep the windows closed when it gets noisy tonight and retreat to the bedroom where we have an air conditioner. Despite having the day off for the 4th I got up at the normal time I get up for work, and by mid-day decided to take a little nap on the love seat in my office. 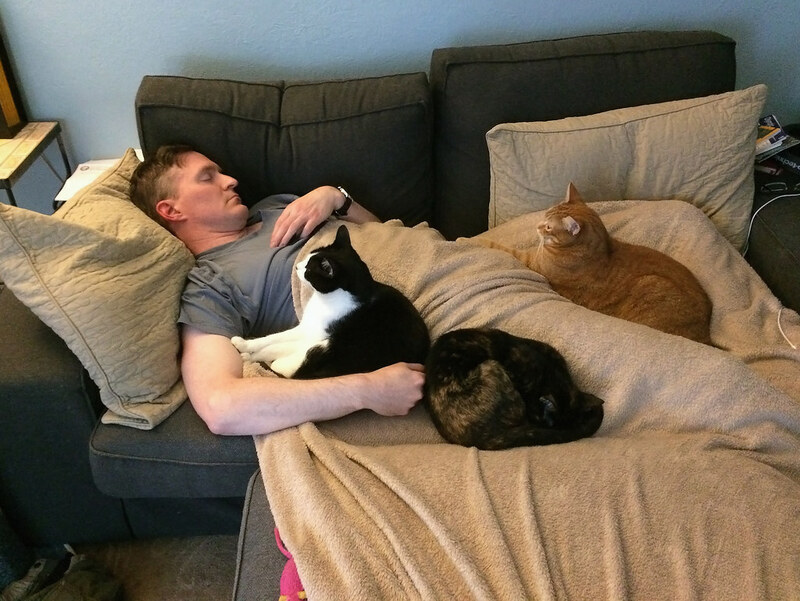 Apparently I wasn’t the only one, as my wife came in and took this picture of me with our three cats all sleeping on me. Boo is the black-and-white cat curled up in the crook of my arm, Trixie is the tortoiseshell beside him, and Sam is the orange tabby in my lap, his favorite spot. Trixie’s beloved pink mouse even made it into the bottom of the frame. Our dog Ellie is not in frame but she was in her bed just below us. there’s a well inside of me that never runs dry. I visited Ridgefield a number of times as my Christmas break was winding down late in December. On the 30th I spent the morning watching a great blue heron by Rest Lake as the sun rose and then another a bit further on in a large meadow, then on another loop of the auto tour a great egret by the Quigley Lakes and ring-necked ducks and hooded mergansers in Bower Slough. 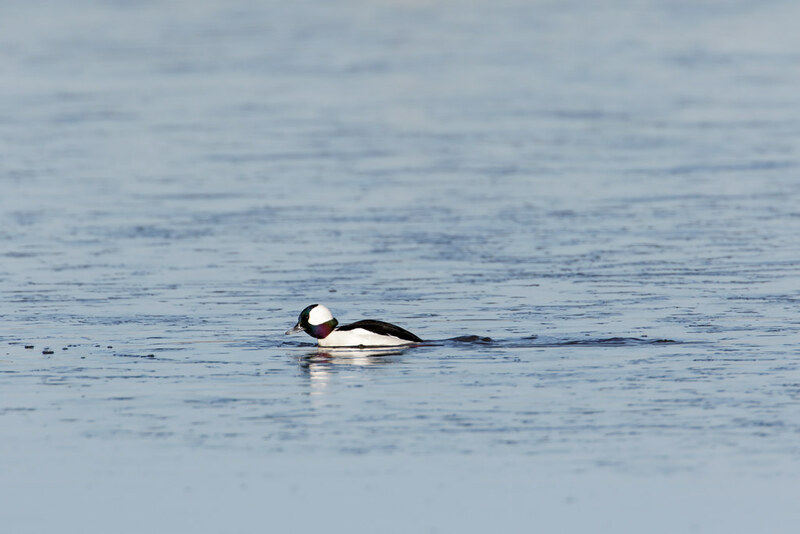 After that the light was a bit high and bright for my tastes so I settled in to watch the male bufflehead above diving for food in a partially frozen Bull Lake. He’s elevated more than normal as he’s pushing through the melting ice in preparation for a dive. My last day of an almost three week vacation. Been great in many ways but worry over Emma’s health has left me a bit worn out. The refuge has been a welcome respite. She’s up to 9.5 pounds now thanks to the baby food, but her appetite waned a bit yesterday and this morning. Don’t know if it’s meaningful or not. I wasn’t that surprised that thinking about Em would bring me to tears, even though she had died a year earlier. I was over-tired and over-stressed and that often leaves me over-emotional. But I was caught off-guard because the tears just didn’t stop. I was already parked beside the road to watch the bufflehead, and since this pond is on the right side of the road, I had moved over to the passenger’s side. Since passing cars couldn’t see me, I let the tears flow until I cried myself out. What broke me was seeing myself a year ago, almost afraid to even put into words a rising fear that our last hope of keeping our sweet little Em alive was about to fade, knowing now that the fear was justified and that we were about to run out of options and she’d be dead in three days. Sometimes it seems there’s nothing more cruel than hope: uplifting when given, devastating when taken away. Almost embarrassing how euphoric I was after finding the bittern, especially after being so upset over Emma earlier … overall a really fun day! And I wrote that even before the last light of the day, when I watched a heron and egret hunting as the sun set. 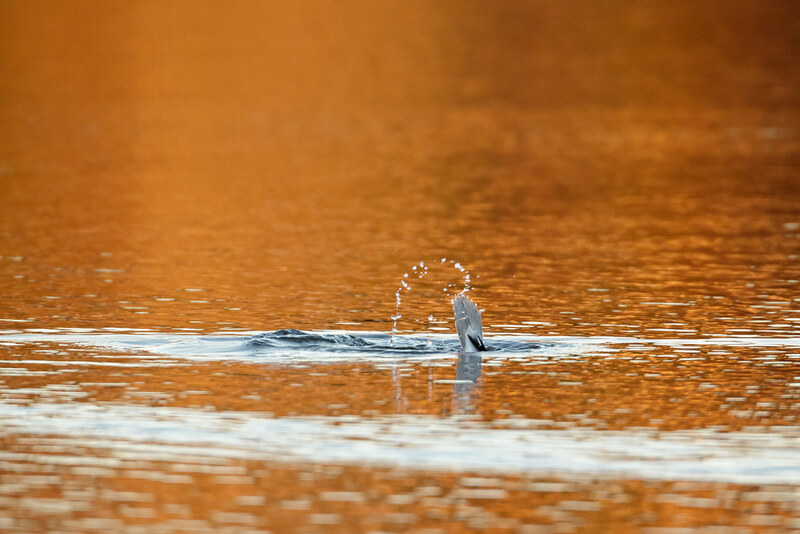 I had to leave to get off of the refuge before the automatic gate closed, but as I drove past Bull Lake on the way out, I stopped for a few more pictures when I saw the bufflehead still diving for food, this time with the water painted orange by the reflections of the setting sun on the hills above the refuge. The perfect bookend for the day, a day that started in ice and ended in fire.